The other day I was rummaging through my old school stuff and putting it into cardboard boxes, when I came across an old story I wrote back at Silverstream School. 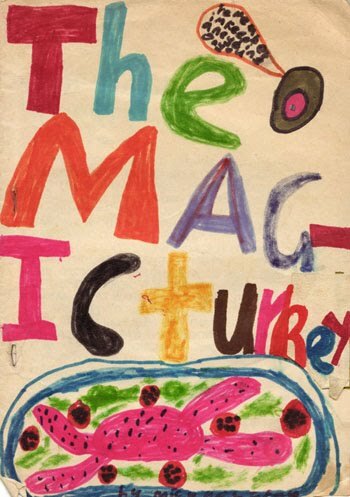 It was called The Magic Turkey. I wrote a number of stories at school over the years – I really loved creative writing but I was never that great at it! There’s no date so I can’t remember which year exactly but it would’ve been between 1993-1999. The story was typed up in horrendous capital letters so I thought I’d spare you the assault on your retinas (although the rest of the punctuation is kept the same as when I wrote it). Enjoy the psychotic ramblings of an 8-year-old-or-so kid. Once upon a time there was a witch called Wanda. She found a turkey in her castle one day. She thought she could make a magic spell for it. Now I need dragons heart, human eyes, frog slime, mouse tail , vampires blood and giants’ spit. Suddenly a cat jumped on to the bench. ” Stop Stop!” said Wanda. But it was too late. The cat bumped the turkey into the cauldron. Then the turkey flew right out of the cauldron. The turkey threw a human eye at Wanda. Bonk on to her head. She tried to run after it but it was too late. The turkey flew out the window. Luckily Wanda saw the window was shut but it went right through the window sill. The turkey flew on and on until he came to a little cottage. It banged right into the door . A little boy opened the door to see who was there but there wasn’t any body there . But just a turkey at the bottom of the door . The boy picked up the turkey and carried it inside . The turkey smelt some muffins baking . Before he could get out of the boy’s hands he got put in a tray in the oven. The turkey just disappeared and appeared again at the boy’s bedroom looking at the boy playing with his toys. The turkey squeaked. “Let’s have some fun before my life’s ended”. So turkey made his best trick on the boy. The turkey hid behind a soft toy. Then he moved over to the boy carrying the pink soft toy with him. The boy suddenly got his eye on the soft pink toy. He picked it up. The turkey clung to the soft pink toy. The turkey grabbed the toy train that the boy was playing with. The turkey threw the toy train into the drain pipe. The boy tried to pick it up but it had already disappeared. The turkey felt sorry for what he had done. So he made himself disappear and appear again inside the drainpipe. He just saw the toy train disappear through the creek pipes. The turkey suddenly saw himself in the sea. He caught a sea plant and tried and tried to hold on tightly, but his feet couldn’t hold on any longer. Then he let go and bumped right in to an octopus . The octopus grabbed the turkey and coiled his legs around him. The turkey screamed “Help! Help! Help!” and then came the toy train and knocked itself into the octopus’s head. The octopus fell to the ground. The turkey escaped. Then there was a loud rumble and bumble. It made the stones clatter and jatter. It was the killer whale. It swam right up to the turkey then suddenly he got swallowed up. He floated down his throat. He tumbled and did somersaults in his throat. A giant was fishing outside his house and he caught a big bite. He pulled and pulled and pulled and up came the killer whale which inside was the magic turkey. The giant cooked the killer whale for ten minutes until it was all nice and brown. The giant served it with tomato , lettuce , herbs and spices . He swallowed every bite one by one . Soon the turkey was in his tum . First he started at the digesting bit . By 5 seconds the turkey was so small that he was only up to your thumb. Now he met the heart right next to him protected by the ribs . Soon he was getting squashed and squeezed and soon he was coming out of his bottom . He saw that there was water at the bottom . Then suddenly he realised that he was at the toilet . He heard a plop then that happened to turkey he plopped right in to the giant’s toilet . He floated up and down until he was at a castle made of iron . There was a sign put up . It said “Dreadful Dracula’s Territory” . The turkey drifted down to the ground . He saw the sign . So decided to check in . The castle’s door creaked and screeched as the the turkey opened the door. It was dark and spooky. There were bats hanging on the ceiling. Then he saw a staircase leading to a room. So the turkey wanted to investigate. So he climbed up the staircase. As he did every step the steps squeaked. As he reached the top and opened the door it didn’t creak. He caught his eye on a case. It wasn’t a case but a coffin made of black leather. Suddenly the coffin opened and out jumped Dreadful Dracula. Then the turkey ‘s heart beat fast and now even faster. Suddenly Dracula leaped on to the turkey and carried him all the way to the kitchen. Dreadful Dracula cooked him for dinner. Dreadful Dracula had a feast called Spook Bat Turkey. It was so delicious that he had to have a rest for two years. Now the Dracula was a flying Drac grandpa flying to every country in the world. Note: I own all rights to this story, so you sneaky hollywood producers better speak to me first before you go about making The Magic Turkey film!